To see a doctor at most hospitals in China, patients must first register (挂号, gua hao, “get a number”). At the hospitals with the best reputations, there is more demand than supply. As a result, people must line up to register, and there are many unscrupulous people [票贩子, piao fan zi, ticket scalpers or touts] who will try to register first and then sell their registration to other people later for a profit. 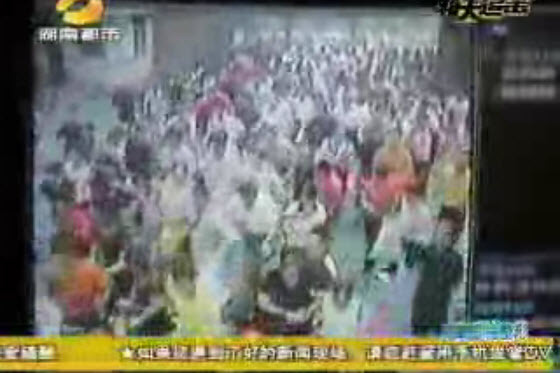 The above video is a news report of the crowd of people waiting behind gates for a hospital to open. When the gates open, they all rush to get registration numbers. Most of the people rushing at the front of the crowd are ticket scalpers and it is apparent that the slower people near the back are people who actually themselves need to use the hospital’s services. A real-name registration system should be quickly implemented, the key is to crack down on ticket scalpers! How sad, truly truly saddening. If not a single person buys registration numbers from the [registration] ticket scalpers, it would not be this crowded. Would a real-name registration system work? Anyone who has been sick and has gone to a good hospital have all had to go two or more times to get a number [get registered] because the outpatient department definitely will not have any numbers/space the first time you go. In front of the hospital are a bunch of ticket scalpers, asking you if you want to buy a number/registration. If you want, then you have to go apply for an outpatient department card and tomorrow he will get you a number before you pay him money. It is no use. The only thing left is to reform China’s health care system. The root [of the problem] is benefits!! These people who are ticket scalpers are also relying on their physical strength/energy for a livelihood!!! If they all had jobs with reliable incomes, would they do this??? Additionally, why do you not consider for a moment that people, no matter how serious their ailment, all want to come to these large hospitals?? The best few hospitals in every province are all like this. You guys are shocked only because you have never seen it before. I have experienced this before at Chengdu’s Huaxi Hospital. Registration begins at 7am, over 20 windows. I arrive at 6:30am, and the lines there are just like the Spring Festival chunyun [the terrible big crowds of Chinese people trying to go home during Chinese New Year/Spring Festival]. Hospitals are places that kill you and expect a thanks. Last time I was at the Zhongshan Hospital in Guangzhou for a kidney stone, an x-ray/CT-scan and an IV was 500 yuan. In the end, there were no results. Only SB line up. At our hospital here, simply paying 100 or 50 [RMB] and you do not need to line up, and moreover you can get looked at first. An ugly society always nakedly reveals its reality. Even if [Usain] Bolt were there, he could not beat them [the ticket scalpers]. This is not a hospital, it is obviously a track field. In this mysterious country, there is already nothing that can surprise me! Anything is possible! What does this have to do with the hospital? This is a national system problem. The registration system should be abolished. There should not be registrations. If you are sick, line up. If you are not, then get lost. It doesn’t matter what we use, it will be no use. China simply has too many people. If you make too many babies, the consequences are your own to deal with. Without looking, [I know] it is a hospital in Xiangya. I have experienced it personally, and am used to it. Notice the guards at the front door. This kind of scene they have already seen many times it is not strange to them. They are very calm. Strongly crack down on ticket scalpers. Protect the people’s right to fair medical attention/treatment, according to the order of who arrived first, relying on personal identification for registration, and when seeing patients, instruct the nurses to always check the registrations tickets/papers with the patients’ personal identification. Have you used a hospital in China before? My experiences have been okay most of the time. What were your experiences?